Training: “How to writing career training report” for CS 3rd year students who enrolled CSC395 Career Training course. CS Program will be provided training in topic “How to writing career training report” for CS 3rd year students who enrolled CSC395 Career Training course on Monday 29 April 2019 at 13.00-16.00 hrs in room CB2306. ** All students enrolled CSC395 must attend this training. The School of Information Technology would like to announce the names of those students who will receive the Work Scholarships for Semester 2/2018. 2. Total working hrs. = not more than 120 hrs. 1) Work report 1 — The working period is during 6-28 Feb. 2019. The students have to submit it within 8 Mar. 2019. 2) Work report 2 — The working period is during 1-31 Mar. 2019. The students have to submit it within 5 Apr. 2019. 3) Work report 3 — The working period is during 1-30 Apr. 2019. 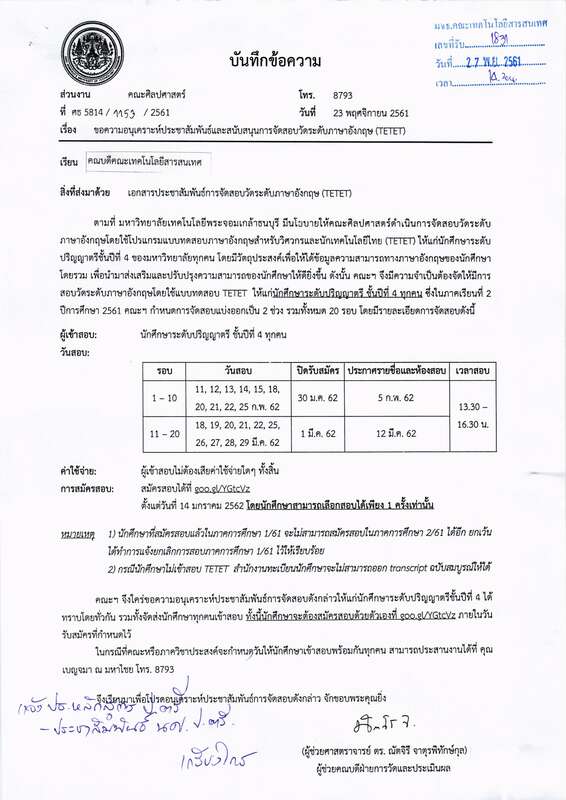 The students have to submit it within 8 May 2019. ** The working hours in work report 1 + work report 2 + work report 3 must be not more than 120 hrs. 6. Please fill the working hours 1 week/sheet. 7. More information, please contact Khun Vichchuda at ELCS’s office, the 2nd fl. of SIT’s building or call 02-470-9866. The B.Sc. CS students receiving work scholarships are required to check work hours in Nov. 2018. The B.Sc. CS students who have received the work scholarships for semester 1/2018 are required check the work hours of Nov. 2018 as below link. If your work hours are wrong, please contact P’Vichy. Students must download and complete the rights transfer form for the project document file. Please return the form to P’Nick on the 2nd floor of SIT building prior December 3, 2018. After your document is approved, you can download the committee page and the rights transfer page from classroom on demand web (CSC499). 1. Monday 29 October, 2018 at 1.30-4.30 pm. in room CB2305. 2. Monday 5 November, 2018 at 1.30-4.30 pm. in room CB2305. CSC494 Information Retrieval will be make up class on Wednesday 24 October, 2018. CSC494 Information Retrieval will be make up class on Wednesday 24 October, 2018 at 3.00-6.00 pm. in training room 4/1 on the 4th floor of SIT building. CSC 210 Analysis and Design of Algorithms will be canceled class on Monday 27, August, 2018. CSC233 Programming Paradigms will be cancelled class on Thursday, August 16, 2018. Reschedule LNG241 Academic Writing I (G.4) the first week of class. – Thursday, August 16, 2018 cancel class. – Monday, August 20, 2018 make-up class at 1.00-4.00 pm. in room CB2305. • วันจันทร์ – วันศุกร์ ตั้งแต่เวลา 8.00-16.30 น. • วันเสาร์ – อาทิตย์ ตั้งแต่เวลา 8.30 – 16.30 น. 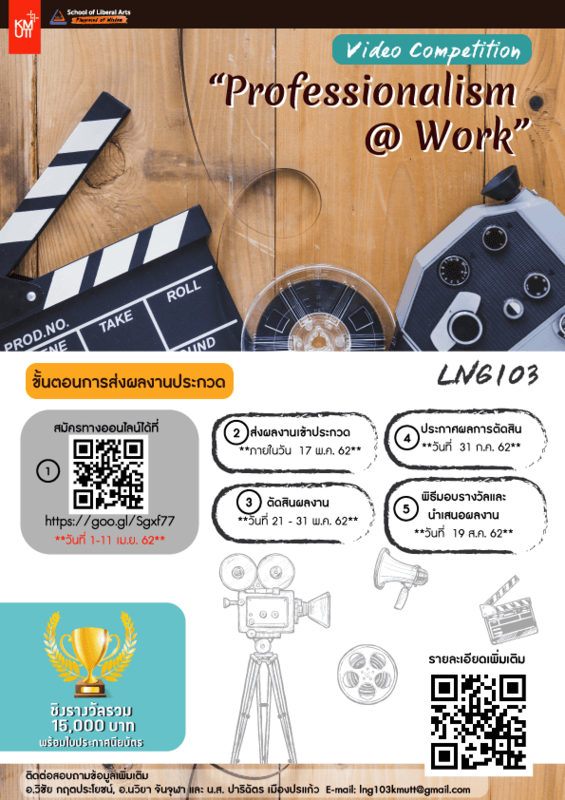 • วันจันทร์ – วันศุกร์ ตั้งแต่เวลา 8.00 – 16.30 น. ลงทะเบียนรอบเช้าไม่เกิน 11.30 น. 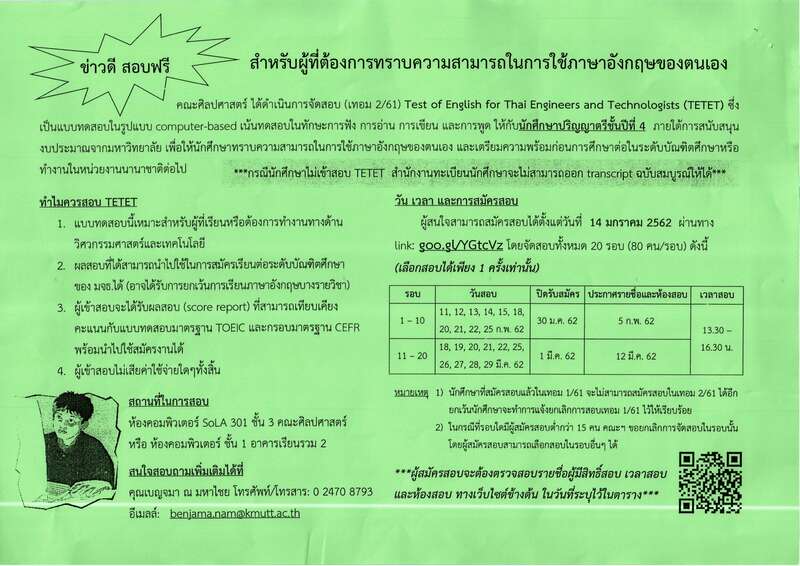 ลงทะเบียนรอบบ่ายไม่เกิน 15.30 น.
CSC105 Re-Exam for students got grade “I”. For information click here. Computer Science programme will offer 5 CSC Major elective courses for reservation round 2. Seniors and juniors reserve courses on Monday 4 June, 2018 at SIT web site (CS News) Start at 13.30 – 16.00 hrs. Computer Science programme will offer 7 CSC Major elective courses for semester 1/2018. Seniors reserve courses on Wednesday 23 May, 2018 at SIT web site (CS News) Start at 9.00 am. – 12.00 pm. Seniors and juniors reserve courses on Thursday 24 May, 2018 at SIT web site (CS News) Start at 9.00 am. – 12.00 pm. Announcement: CSC499 CS Project students can access Makerspace room to complete the senior project. SIT has provided Makerspace rooms and lockers for students to complete the senior project in room CB40802 & CB40803 on the 8th floor of CB4 building. Students can access the room from 4 October, 2017 onward. CS program has stuck the number of CS project group on the tables and lockers, please use your number. Please see the attached file for regulation for use the Maker Space room and the list number of CS project group. CSC103 CAO will be make-up class. CSC103 CAO will be make-up class are as follows: – Friday, September 15, 2017 at 3.00-4.30 pm. in classroom 4/2 on the 4th floor of SIT building. – Monday, September 18, 2017 at 3.00-4.30 pm. in room CB2312. CSC102 Computer Programming I will change timetable on Friday, September 15, 2017. CSC102 Computer Programming I will change timetable on Friday, September 15, 2017 at 1.00-3.00 pm. in training room 1-2. The School of Information Technology would like to announce the names of those students who will receive the Work Scholarships for Semester 1/2017. Conditions and Process 1. Working period from 4 Sep., 2017 – 30 Nov., 2017. 2. Total working hrs. = not more than 120 hrs. 3. Working rate 50 baht/hour, but not more than 300 baht/day, not more than 40 hrs./week or 2,000 baht/week 4. 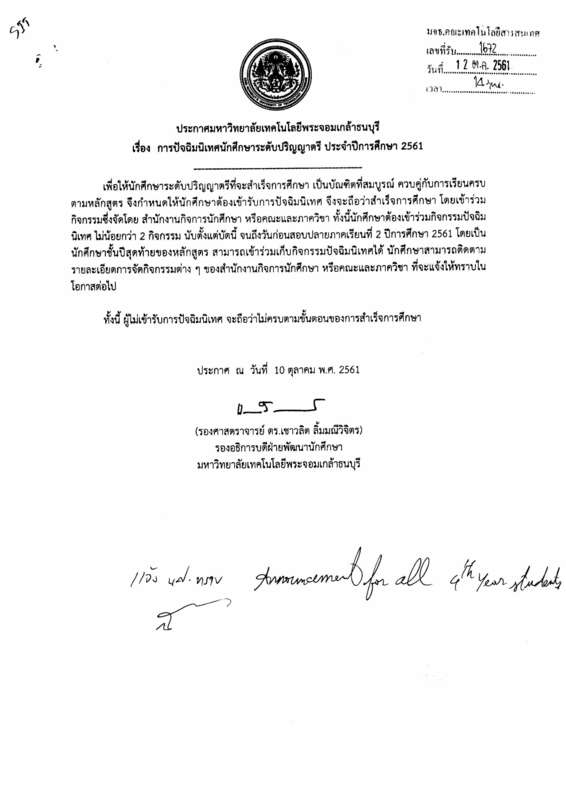 Total amount of scholarship = not more than 6,000 baht 5. How to submit the work report. The students are required to submit the work report 2 times. Those are: 1) Work report 1 — The working period is during 4- 30 Sep., 2017. **Work hours not more than 40 hrs. ** May we request the students to submit work report within 20 Sep., 2017? 2) Work report 2 — The working period is during 2 – 31 Oct., 2017. The students have to submit it within 7 Nov., 2017.